In the Fall 1999 issue of The Boer Goat, an article explains the history, pedigree and other criteria for the distinguished title of Ennobled. Article about Powell-Holman ran in the premier issue ofThe Boer Goat, official publication of the American Boer Goat Association. Here are the text and pictures in that article. In the September 1997 issue of Ranch & Rural Living Magazine, an article outlined how we got our start in the Boer goat business. 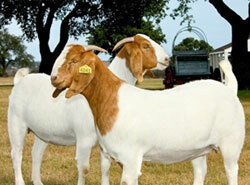 We were already in the ranching business, raising Angora goats and other livestock. You can read the text of this article here. The October/November 1997 issue of The Boer Goathighlights some do-it-yourself goat projects designed and constructed by Jimmy Holman. View the text and pictures for this article here.